Submissions of 4000-9000 words (in any language). Initial submissions may be in any language and will be peer-reviewed accordingly. Duke University Press requires publication in English, and we will commission translations of accepted submissions in the latter process of review. 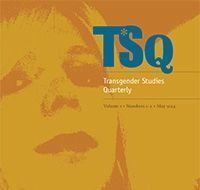 Accepted submissions will be published in the original language on TSQ’s Web site. Please send inquiries and submissions to dgl AT email.arizona.edu. TSQ’s style guide is available here.